Besides, as fate would have it, just last week I had the best whiskey sour I’ve ever tasted. It was served at “Mixing at the Mansion,” the Bourbon Women-Kentucky Distillers’ Association event on Aug. 15. I have ordered plenty of whiskey sours over the years, enjoying the interplay between the sour fruit and the sweet bourbon, but most of them are ultimately too acidic. These cocktails were more of a sweet-sour, very easy to drink. I contacted an insider at the Governor’s Mansion and discovered the secret ingredient: frozen lemonade concentrate. The recipe follows below. Mix the above really well. A little bit of egg white. (OK, maybe this is the secret ingredient. As a novice bartender, I’d never put egg white in a drink, but by golly, it gave this drink oooomph.) Shake until frothy and pour over ice. This made four good-sized drinks. 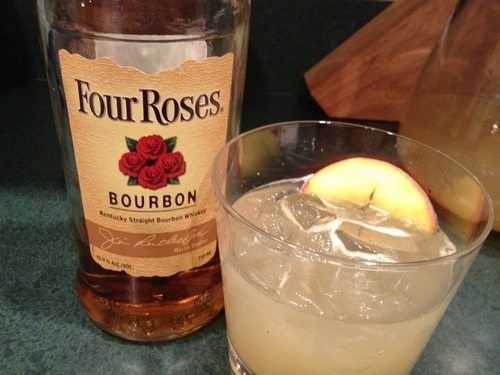 Garnish with peach, raspberries or other fruit. 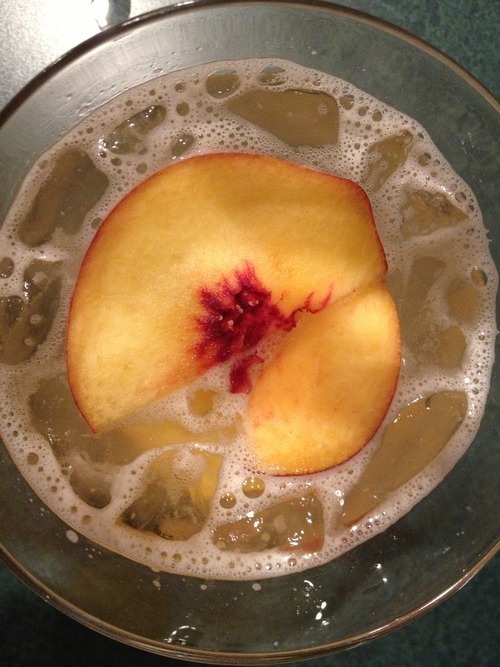 As they did at the Governor’s Mansion, I garnished with a thin slice of peach, which adds another layer of complexity: As you bring the drink up to your lips, you first get a whiff of peach, followed by the smooth, sweet-sour flavor. Mmmmm. You add raw egg whites to this? 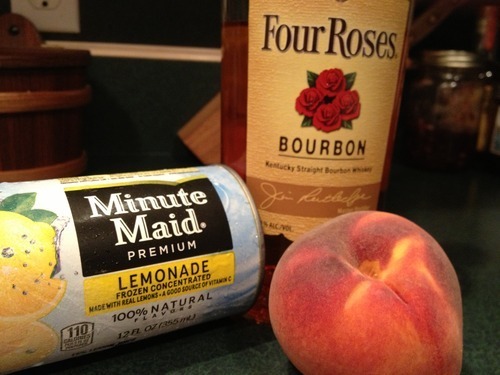 Im not a bartender or drink maker at all, but I want to try this, just want to make sure I make it correctly. Yes, Nick, that’s right. It doesn’t take very much – about 3/4 of an ounce of egg white per cocktail. Shaking it turns it into a nice foam (think meringue, but not as thick) but doesn’t add egg flavor to the drink. Shake all ingredients and pour over ice, as above. If you would rather shake the ice, too, FIRST shake the other ingredients (including the egg white) and then do a short second shake with the ice and strain into the glass. If you add the ice to that first shake, the egg white won’t foam. Let me know how it turns out! Could have been the egg white; could have been the 10 drinks. But yes, consuming enough raw egg can indeed make you sick, so let’s be careful out there. What a great idea for a party, Judy! Let us know how the drinks turned out. I always use a full egg and a can of club soda instead of water. It always turns out super and I always have to make one more and there is no left overs.